He’s been addressed by many colloquial titles in his more than 50-year cooking career. “Star of the Show,” being the latest. Ted Brennan’s Decatur Executive Chef Lazone Randolph has resumed the role he was meant to play, and did, for decades. 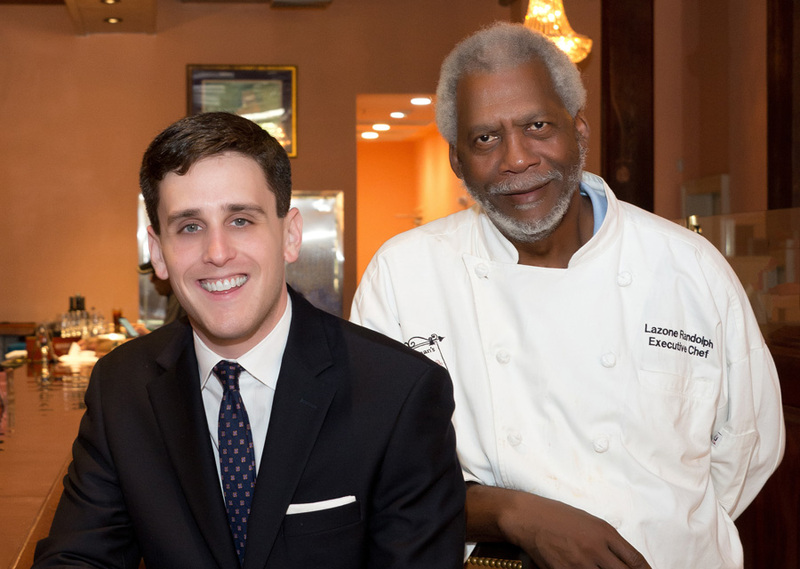 When the descendants of New Orleans’ Brennan family restaurant dynasty stepped down from the renowned Brennan’s on Royal Street and reached out to begin another Brennan restaurant several blocks away, they knew they could count on Chef Lazone to join them in their new enterprise. Chef Lazone rightly been praised as, “last of the great Creole chefs,” by Poppy Tooker, author, radio host, TV food commentator, cultural ambassador, and all things culinary, in a 2013 website post. “The Rock,” is how Chef Lazone is described by third generation members of the Brennan family who recently opened Ted Brennan’s Decatur restaurant in the French Quarter. Ted Brennan, the son of Brennan’s restaurant- founder, Owen Brennan, managed Brennan’s for 40 years with his two brothers after the passing of their father. After the Royal Street restaurant was sold (subsequently bought by another family member restaurateur, Ralph Brennan and Terry White), Ted Brennan and children, Teddy and Bridget Brennan Tyrrell proceeded to find and open their new place. Complications, renovation, and other matters stalled the project for longer periods than expected, but the family was committed. Sadly, they lost their father along the way due to a heart attack, but the project went on, now dedicated as a legacy to their father and his heritage. Chef Lazone has spent his entire career with the Brennan family at Brennan’s on Royal Street. In 1965, just after graduating from Carver High School, he began as a dishwasher. Under the tutelage of several generations of New Orleans’ royal restaurant family, he began cooking, which he always aspired to do. “Quality, consistency, following the recipes, and style were what mattered,” he said. Randolph trained under revered Dutch Chef Paul Blangé, his most significant mentor. Chef Lazone was named executive chef in 2005, succeeding Chef Michael Roussel, who had followed Chef Blangés tenure. During his years at the Royal Street Brennan’s, Randolph traveled to London to cook for a large group at the United States Embassy, and was a guest chef at London’s Hotel Meridien for several weeks. He also traveled to Ireland for a Delta Airlines promotion, and to Hawaii to prepare food for a large meeting planners convention. In addition, Chef Lazone has appeared on numerous cooking shows on The Food Network including the Rachel Ray Show, Unwrapped, The Travel Channel, Public Broadcasting Station WYES-TV, and local morning programs. His passion for Creole cooking and devotion to the Brennan family members, who steered him along the way, is heartfelt and evident in every course he prepares. On the restaurant’s second floor, besides the Gold Room, Red Room, Patio Room and Wine Cellar private dining room, there’s the Randolph Room, an honor to Chef Lazone.